A dog’s instinct is to chase. Another instinct is to pause before pouncing on their prey. Pointing dogs find game by scent and have a more developed instinct to pause, hence, pointing out the location of the game. 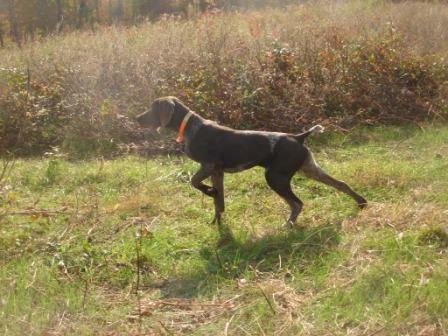 These pointing dogs are then trained to maintain the point until the game bird is flushed and shot. When Rikki, my German Shorthaired Pointer, is on point, she is almost mesmerized. If you look at her eyes, she appears to be in a trance like state as she stands statuesque never blinking or moving. This trance is certainly an emotional experience with the reward of powerfully positive brain chemistry (neurotransmitters). When she was pregnant, my older friend suggested that I put her on point saying it would help the offspring later. While I did not entirely believe it would make any difference, it certainly could not hurt. Much to my amazement the puppies demonstrated an unusually strong pointing instinct without training. They would stand point and not give chase as previous litters. Is this purely genetic or did the puppies experience the emotions of the mother in the womb making it more likely for them to respond in the same way? This example opens many possible questions. Could the emotional experiences of the mother be “imprinted” on the offspring? The concept of cellular memory has been studied in many life forms including yeast, worms, and mice. There are many theories as to how such memory works. We are a culmination of all the life experiences of the past. In some ways our brain is hard wired to seek out and experience the same thoughts, feelings, or emotions that we have always experienced. Changing these patterns is the frontier of medicine.